Direct Mats is a leading supplier of interlocking jigsaw mats. We have a number of colour and size options in stock. Please browse our online store and feel free to contact us with any questions. We keep jigsaw floor mats stock in both our Sydney and Melbourne warehouses. Please feel free to call us or send us an email to find out if the item you require is available as certain items can run out from time to time. We can ship mats throughout Australia. 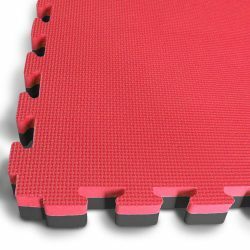 At Direct Mats we have an great range of training and gym mats for you from which to choose. When planning your training area be sure to consider what thickness you require depending on how high impact the activity is that you are under taking. So the higher the impact the activity the thicker the mats should be. We have mats from 20mm to 40mm which should be suitable for most activities. If in doubt consult a professional. It is important to note that safety mats are no substitute for commonsense and care. Whilst EVA mats might reduce injury they will not prevent injury altogether. The prevention of injury is always up to the user of the mats and care should be taken to have a well thought through training plan that takes into account the best ways to minimize injury during physical training. As well as our foam mats we also have wall mats available. The wall mats are made from heavy duty vinyl and compressed foam. They also have a timber backing which makes it easier to attach to a wall. 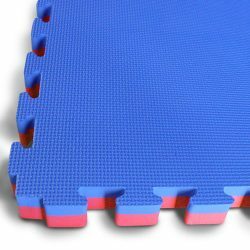 Wall mats or wall padding, as they are also know, are great for protect yourself or your students from impact with walls. It is important to think about the effect impact with other objects other then the floor can have when training. If you have any questions about out training mats feel free to give us a call or send us an email. We will do our best to answer your questions. Also if there are certain mats that you require that you don’t see on our website then let us know. Our off-shore manufacturing resources give us the ability to source a large range of training equipment. 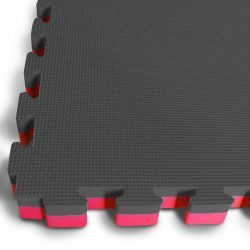 Our interlocking floor jigsaw mats are dual colour meaning they are one colour on one side and another on the other side of the mats. This is so that you can create borders and designated areas in your training area. All mats come with edging on all four side which can be cut to suit your area. The mats are made from EVA foam so they are easily cut using a Stanley knife or any kind of box cutter. Please be sure to place something underneath the mats when cutting so you don’t damage your floors.